If you are looking for the best potato soup recipe, then you are in the right place! This potato soup is creamy fully of tender bites of potato, vegetables and ham. My picky eater wants this recipe over and over, and is creamy and delicious with two thumbs up from the whole family. This is also a great recipe to use leftover ham from the holidays, or just whenever you want to feel cozy. I’ve learned by moving around that a good ham and potato soup recipe is kind of a regional thing. Sure, you’ll find it on the menu sometimes in the middle of winter, but here in the midwest? Ham and potato soup is on the menu pretty darn often. I honestly never noticed just how often ham and potato soup was on the menu until we moved away… and I was in the mood for a cup! While we did move back to Ohio where potato soup is everywhere, this recipe I made for homemade ham and potato soup is so delicious it has pretty much spoiled me. I’m not the only one who felt like that either. I sent a little video of this soup bubbling to my friend Kathlena at The Allergy Chef and it looked so tasty? 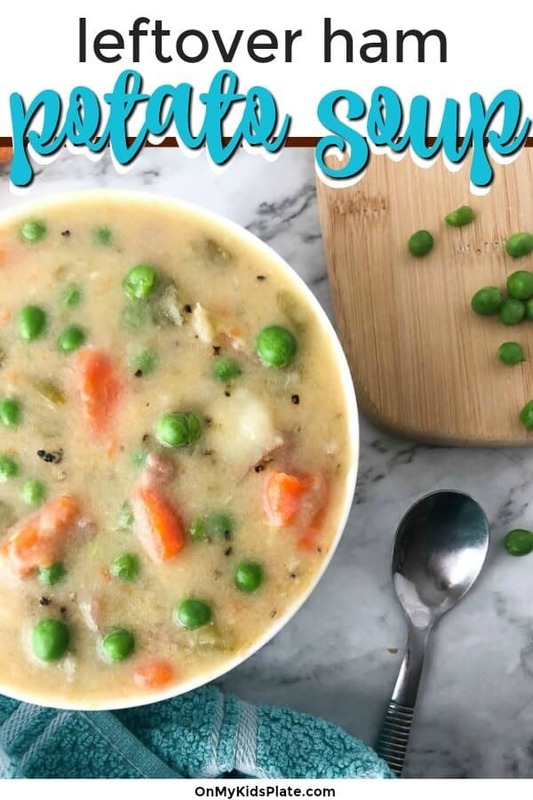 She made an allergy-friendly version of this ham and potato soup recipe that is free from gluten, dairy and all eight of the top major allergens. This version of ham and potato soup is creamy without being heavy, and full of delicious bites. It’s a simple recipe that has that homey feeling and is easy to make. I also always use real, whole fresh ingredients when I cook which almost always means it’s tastier. In our house, we also mostly use organic milk and dairy, low sodium organic chicken broth (just like I did in my chicken noodle soup), and fresh (or sometimes frozen) vegetables. To make the best potato soup you’ll start off by softening carrots, celery, and onion with simple seasonings. Then add potatoes and ham to the soup recipe, letting them simmer until they melt on your spoon. Finally, you’ll add your favorite dairy or dairy alternative, and a roux (which is a mixture of flour and butter or oil) to thicken your soup. 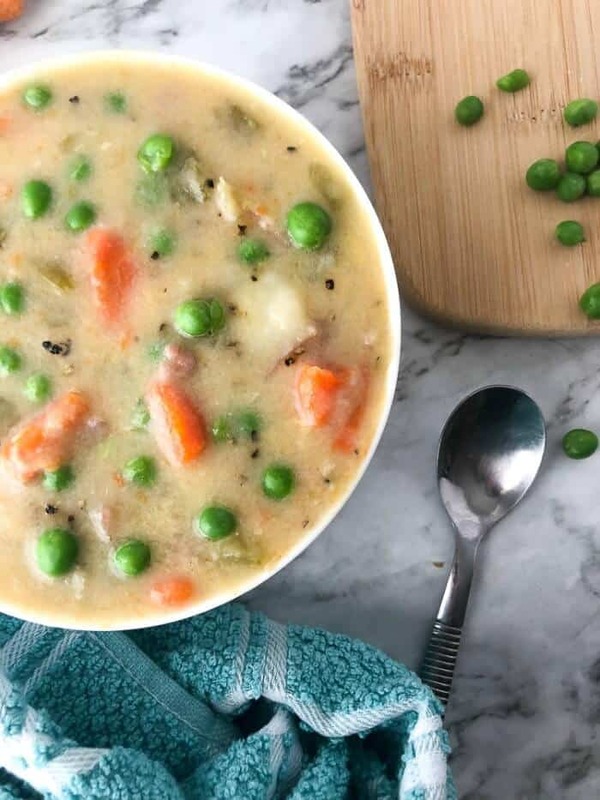 The trick to making the best potato soup making your soup both creamy and full tender bites of potato, ham, and peas. Leaving tender bites in your soup makes it feel rustic, but also is filling. At times I have tried removing some of the potatoes after cooking them and blending them for a smoother and creamier version, but ultimately we prefer leaving it more rustic in our family. Can you make this potato soup recipe with leftover ham from Christmas or Easter? This ham an potato soup is also a great way to use up leftover ham from the holidays. I tend to stash my leftover ham in the freezer already cubed to use with this soup and eggs. If you don’t have quite enough ham this recipe will still work just fine. How Long Can You Keep Potato Soup In The refrigerator? You can keep this ham and potato soup recipe in the refrigerator for about three to four days safely. Or you will need to freeze the soup for another day. Can you freeze this ham and potato soup recipe? You can freeze this ham and potato soup recipe, though not all creamy or milk-based soups freeze well. This soup works well because the thickening agent is a combination of flour and butter. This soup does tend to thicken when in the refrigerator or freezer however, you may want to add just a little water as you reheat to get the right consistency. How do you thicken Ham and Potato soup? I thicken this ham and potato soup recipe by adding a roux. You can make a simple roux by melting a tablespoon of butter and then adding a tablespoon of flour to a pan and cooking for a minute before blending well into your soup. This soup recipe already includes a roux, but if you find the soup is too thin you can add an additional tablespoon of the flour/butter combination to thicken your soup. A second way to thicken ham and potato soup is to blend some of your vegetables. Remove roughly half a cup of your cooked vegetables (potatoes, carrots, celery, and onion) and blend with a few tablespoons of water in your blender or food processor, then add it back to the soup. When I’ve used this method, I usually remove any bits of ham as we prefer to keep them as a hearty bite in the soup. Wait to thicken your soup until towards the end, often the soup thickens as you cook it. If you thicken the soup too much, you may find you need to then add more water. Can I make this recipe gluten-free or dairy free? 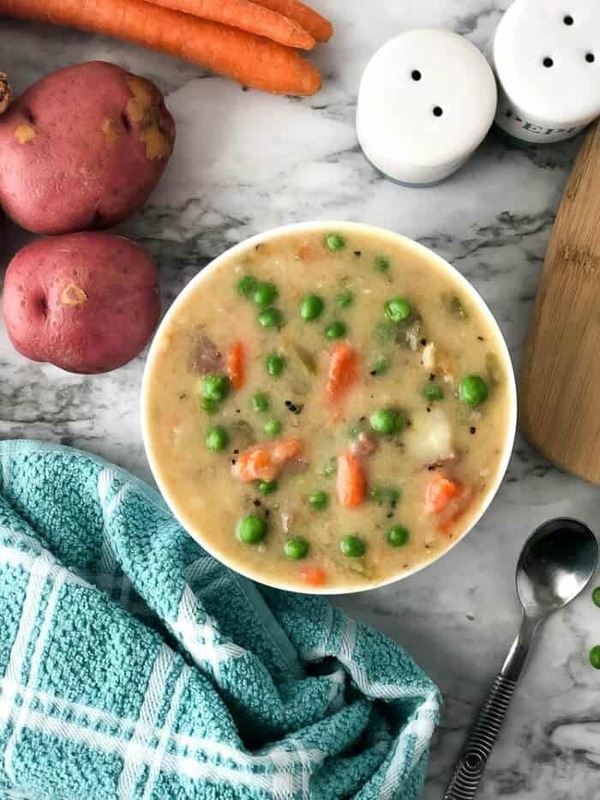 My good friend Kathlena over at The Allergy Chef made a delicious version of this very potato and ham soup and it’s top eight allergy free which includes makign it gluten and dairy free. I had sent her a picture of mine, and wouldn’t you know she replicated it spot on! What goes with ham and potato soup? This soup is such a hearty soup that I often make it with something green such as a simple salad or roasted broccoli. You could also pair this with a lighter sandwich such as grilled chicken or a BLT. A grilled ham and cheese sandwich also tastes delicious with this soup, but I often find it is a bit heavier of a meal and opt for half of a sandwich when I’ve made that. Sometimes we have this soup for dinner all by itself. Can you make this ham and potato soup in the crockpot or slowcooker? This ham and potato soup recipe is really easy to make in the crock pot too! Add all the ingredients for the soup base to the crock pot, an cook for six to eight hours on low or four hours on high. Right before it’s time to eat turn the crock pot to high, then make the part of the recipe to thicken the soup on the stovetop. Now add this mixture to the crockpot, stirring well and letting it cook for a few minutes. Your soup will be just as delicious! Like crockpot recipes? Try this pork loin in the crockpot, it’s easy peasy! Why Add Frozen Peas At The End Of The Potato Soup Recipe? Adding the peas at the end of the recipe from frozen helps the peas keep their beautiful bright green color. I’ve found this not only makes the peas more tasty looking, but the frozen peas also help to cool down the soup a little. This hack has helped my picky eater learn to enjoy soup much more quickly. I simply add a handful of frozen peas to each bowl right before serving. This easy and creamy simple potato soup recipe is full of tender bites of ham and savory vegetables. ake this homemade potato soup recipe to serve for dinner next to a hearty sandwich. This soup is also perfect for using up leftover ham! 2 cups frozen peas (optional) Add a handful to each bowl at the end. Turn your burner on to medium-high. Add olive oil to the bottom of a large pot and let heat. Add carrots, celery, onion, garlic, salt and pepper to the pot and saute for two to three minutes. Add diced potatoes, ham, thyme, water and broth to the pot. Bring the pot to a boil, then cover the pot with a lid and reduce the heat to medium-low. Cook for 20 minutes until potatoes are soft all the way through. In a separate pot over medium heat melt butter. Add flour and cook for one minute, stirring continually. Add milk to the pot, and stir well until combined. A whisk can be helpful to make sure the flour is fully mixed into the milk. Combine milk mixture into the larger pot and increase heat to medium-high. Soup with added milk mixture should cook for three to five minutes, or until it begins to thicken. Serve and enjoy! This soup does thicken with time. When reheating leftovers, you may need to add a little water or milk to even out the thickness. Did you make this recipe and love it? Leave me a star rating so others know how delicious it is too. Have a question about this recipe? Drop a comment down below.